Last week, we were treated to one of the best matches this show has ever put on and quite frankly in my opinion, the best casket match of all time in Fenix vs. Mil Muertes. Fenix came out on top to seemingly end that long feud over Catrina’s services of evil. 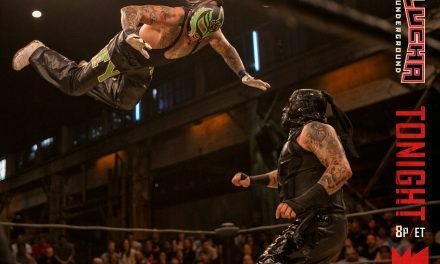 This week, we take a major shift to some other storylines on Lucha Underground, more specifically stories surrounding two titles: The AAA title, and the new and improved Lucha Underground title belt. That new belt is an absolute beauty by the way, one of the best designed world titles out there right next to the IWGP belt. But the AAA title is being fought over by Texano Jr. and champion Alberto El Patron. El Patron whipped Texano senseless with Texano’s bull rope in their previous matchup, leaving the referee no choice but to DQ him. So of course, we now get a Bull Rope match for the title. Konnan’s gotten some pretty cool vignettes the past few weeks about exacting revenge for the beatdown he received from Cage and for having to throw in the towel when Cage beat Prince Puma for the #1 contender’s spot. His protégé, champion Prince Puma, has to defend his title against Cage once again in a brutal Street Fight. Anyway, let’s move on to the show. Ivelisse is beside herself and can’t believe SHE got dumped, and not vice versa. Son of Havoc is not firmly a babyface. Ivelisse then kicks Angelico who is like that one douche who tries to hit up the girl who just got out of a long term relationship. Dario Cueto’s office. He’s signing someone officially. Who is this? According to Cueto, Konnan has high praise for him…IT’S HERNANDEZ! Wow, I feel like it’s been forever since I’ve seen him, and was always a personal favorite of mine in TNA. Awesome. Konnan is now seen training Puma in the gym, with intermittent flashes of Cage flashing through his mind. In walks Hernandez, Konnan even drops the LAX reference here. Hernandex tells Puma he’s a big fan. Hmm, very interesting. Puma embraces Konnan with new Lucha Undergound title belt! Yay! Final Thoughts: Even with two title matches, I don’t think this show was quite the landmark like last week’s episode. But you gotta remember, that had Grave Consequences which was truly a MOTY candidate so it’s hard to follow an episode like that. Regardless, we got all solid to good matches from everyone here. Finally, Son of Havoc broke away from Ivelisse to become a babyface. Thought the main event should have been more about Puma/Cage and not Konnan/Hernandez, but I understand that it helps further the story here. Not exactly sure what’s next for champions Alberto El Patron and Prince Puma. I think Puma will be getting another challenger soon, hopefully Fenix seeing as he’s on fire (bad pun) right now and it makes sense. We may get one more match between Texano and Alberto, so we’ll see.